The inspection includes the following major systems which are inspected in approximately the order shown. Crawl spaces are inspected nearly last in the process, after plumbing fixtures have been operated and leaks would be easier to find. EXTERIOR and ROOFING: The inspector walks on the roof (where safe and appropriate) and notes deficiencies. Roof runoff controls and landscape drainage is checked and improvements are recommended where necessary. Stoops, steps, walks, and drives are checked for voids, surface problems, and safety hazards. Wall cladding, trim, exterior doors, decks, balconies and railings are inspected as well. STRUCTURAL COMPONENTS: The structure of the building is identified in terms of materials used, type of construction, and the degree to which various areas are accessible to the inspector. Significant sub-components, such as foundation type, framing materials, etc. are listed and any findings are noted. The inspector also checks for major or minor problems in the various structural systems of the building, including the foundation, floors, walls, and roof framing. Water seepage issues and resultant structural problems are evaluated and recommendations for improved water control are given as needed. GARAGE: The condition of walls, floors, ceilings, doors and windows is inspected and the safety aspects of any automatic openers are inspected. All manual overhead doors are operated as well. PLUMBING: The piping and the fixtures throughout the house are checked for functional flow and life expectancies. The systems are screened for unsanitary conditions and potential repairs, such as freeze vulnerability or spillage/overflow. The laundry equipment, tile work, and domestic water heating equipment are inspected also. Fuel storage and distribution systems are inspected and included in this section of the report. Plumbing distribution components and drain materials are reported with serviceability comments as needed. ELECTRICAL: The electrical system is checked for sufficient capacity and safety. The inspector evaluates the system in terms of its current condition, and considers its suitability for future intended use. Upgrades and repairs are recommended where appropriate. Service size, ground fault and arc fault interrupters and smoke detector operation are checked and reported on. HEATING AND AIR CONDITIONING: The inspector operates the systems to assess the capacity of the existing equipment to produce comfortable conditions. Distribution systems, solid fuel heating devices, gas logs, chimneys, flues and vents are also inspected. By considering the age of the existing equipment and the intended capacity, the inspector can report on components which are nearing the end of their service life. INTERIORS: The inspector scans the walls, floor, and ceiling surfaces for problem conditions, such as visible evidence of water penetration, potentially dangerous or toxic materials, fire hazards, or unusual settling cracks. 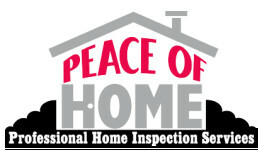 Windows, doors, interior railings, counters and cabinets are also inspected as part of this section. INSULATION AND VENTILATION: The inspector assesses all visible placements of insulation, vapor retarders, attic and foundation ventilation, kitchen and bath vents, dryer vent material and placement and any ventilation fans in attic and reports materials, R Value and other relevant findings as appropriate. Copyright ©2005 Peace of Home.